Hoya carnosa (wax plant) is an evergreen vine with thick, dark, cascading leaves that make hoya perfect for planting in a hanging container. In spring and summer, hoya will produce waxy, creamy white blooms that will dangle from the plant. Although hoya prefers not to be re-potted, there are times when it's necessary to move a pot-bound hoya to a larger container. 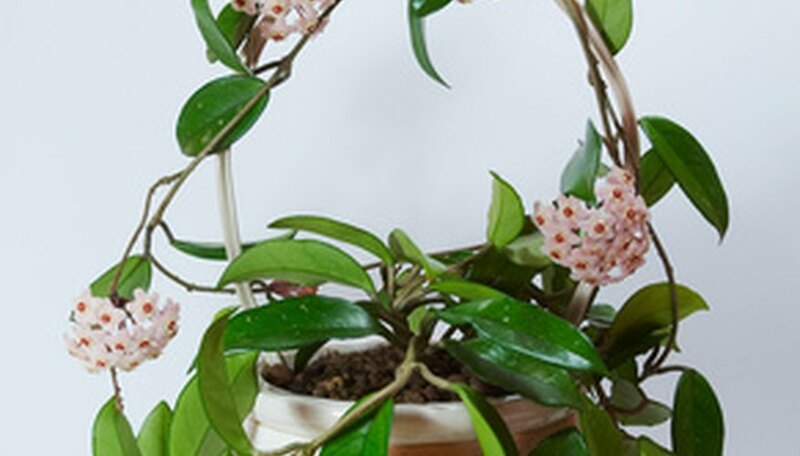 If your healthy hoya has stopped growing, or if you see white roots growing through the bottom of the pot, it's time to re-pot the hoya plant. Choose a new container for the hoya. Plastic pots are lightweight and inexpensive, but not as durable as clay or ceramic pots. Clay or ceramic pots are sturdy and long lasting, but they may be too heavy if your want to hang your hoya. The container should be only one size larger than the hoya's current container. Be sure the container has a hole in the bottom. Scrub the container with a mixture of one part bleach to 10 parts water. Rinse the container several times to be sure every trace of bleach has been removed. Fill the container up to about an inch from the top with a good-quality commercial potting mixture. The potting mixture should be peat-based, as a peat-based mixture will hold moisture but will also drain well. A peat-based mixture will also be lightweight. Moisten the potting mixture before you re-pot the hoya. Water the hoya about an hour before re-potting. The hoya will tolerate the stress of re-potting more easily if it's well-hydrated. Place a piece of wire mesh or a piece of broken pottery over the hole in the bottom of the planting container to keep the potting mixture from washing through the hole, without blocking drainage. Remove the hoya plant carefully from its container. Loosen the roots gently with your fingers if the roots are matted or compacted. Fill the new container about 1/2 full with potting mixture. Place the hoya in the container and check the level of the plant. The top of the hoya's roots should be about an inch below the top of the new container. Adjust the potting mixture in the bottom of the container as needed. .
Add more potting mixture to the container, tamping it gently around the hoya's roots. Continue filling the container up to the top of the roots, leaving an inch at the top of the container to allow for watering. Water the hoya. Put the hoya back in it's usual place, and resume normal care.